This Stage or Band Package has everything you could want for a small live performance! Perfect for bands and other small stage performances, this package is a perfect bundle of all the gear you need to give your performance a more exciting and professional look. 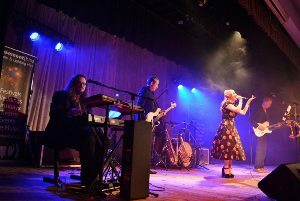 So if you want to hire lights for a band gig or if you are keen to rent lights for a performance, then look no further! We are lighting specialists and can happily assist you with your hire needs. If you need any extra lights or want some special FX to add to your performance (haze machines make the lighting effects look fantastic!) then check out our range of equipment available for hire. Not sure what you need? Give our friendly team a call and we help you out!